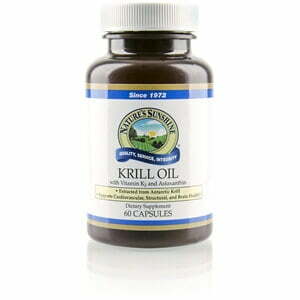 Nature’s Sunshine Krill Oil with Vitamin K2 provides a vast source of essential omega-3 fatty acids, including EPA and DHA. Omega 3s supports cardiovascular and brain health, provide joint and skin support and may help support cholesterol levels already within the normal range. Krill is a natural source of astaxanthin, a powerful antioxidant carotenoid. Vitamin K2 is added to provide added support for the cardiovascular system and bone health. Krill oil naturally contains phospholipids, which bind to the omega-3 fatty acids, improving their absorption in the body. These phospholipids provide strength and elasticity to the cell membrane, helping to keep toxins out and let nutrients and oxygen in. Instructions: Take 1 capsule with a meal one to two times daily. Gelatin, glycerin, and water. Contains refined fish oil such as herring, anchovies, and sardines.